Hey Ebola, I remember you mentioning that you were having WR issues recently. I see in the news you're kicking [edited]and taking names in the Congo. The skorps had like 3-4 bushes in front of them so it was impossible to see them unless someone drove up there. Thankfully my teammate did that and which caused them explode quickly. So in short, the skorps were bushed up to spot through the bush and proceed to mess me up. All they had to do was drive up to the bush so that they can see through it. Back up so its solid and then fire. Rinse and repeat till someone dies or until it becomes unsafe to do so (proxy spot). I've not played LTs in a while, so there are some map features that I am still unaware of. That dip, on that map for instance, is one of them. I am aware of what Proxy Spotting is, I just had no idea those Skorps could bush up 3 to 4 deep like that, in that area I mean (I know how to stack camo values with bushes and be within the 15m "invisisnipe" range). Dem booshes iz strowng! Usually if I am driving an LT I spot in the coal deposits. Watching that replay gave me a few ideas to try. I was talking about the 105 being the hunter/killer vs a real scout tank, and that game showing me the scout part. Which is fine, I just thought it was kinda of funny. Goodness, how many more Sherman variants that aren't US will they be introducing into this game!? How does it play? I need to look up the stats. Course, won't matter if I ever want it, until Amazon Pay gets fixed...I'll be saving money for a long time. Not that I am playing much right now. I gotta get my wins in SOMEWHERE! My Friday off I spent most of the day playing tanks, badly (surprise). Mostly grinding Tier IX that need upgrades to modules. I mean if you can get within 200 meters of someone to assassinate them, and pray that the 13 105's gun does not derp a shot that bounces/misses then it can be an assassin. I usually find the t-100 chasing me down in the 13 105 lol. So, it isn't an assassin type tank? I'm confused now. I imagine probably right after you've dumped your clip! LOL. You can boom and zoom for sure, but that usually is late game unless you are suiscouting. The play style is mixed because it does not have the best camo, nor does its derpy gun do it any justice. Lorza Sherman is a bad EZ8 clone. Slower, No armor anemic damage but excellent depression and rapid rate of fire. There nothing special about it but it a Russian Medium premium.with wet storage so probably will not get ammo racked a bunch. Of course it comes with a zero perk trainable crew and it is Russian so I love it. . I am weak like that. It is also fun when you get to kill one. It is like dancing with death and winning. Sweetest sound in the world is that massive gun shooting at you and missing. Hmmm...ok. Looks like I need to watch more game play on it then to understand the play style. Obviously it has a fairly high skill ceiling to make it work well. Who is she? I've never heard of her. Ah, ok. I don't like the EZ8 at all...so yeah...that'd be a really bad choice for me. She is a small streamer but fun to play with! I get to be arty fodder, instead of her lol. So here is a post for all four codes with 4tankers video on how the event works just so that it is all in one place. To enter the codes click on the Premium shop button at the top of the forum page. 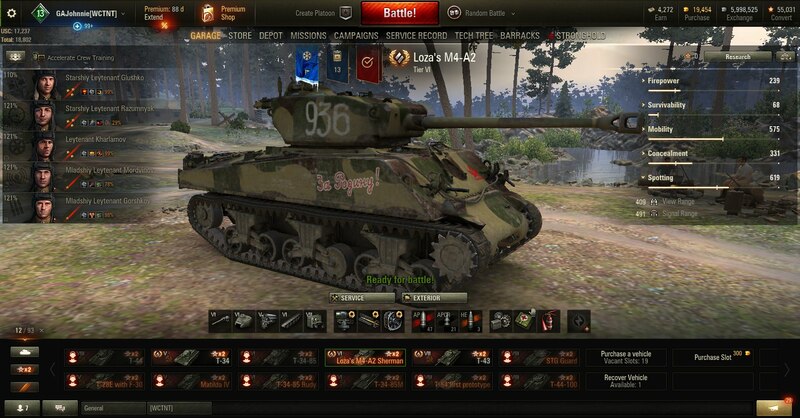 When you go to the premium shop, there is a "redeem Wargaming Codes" button in the upper right corner. Click on that and enter the codes in the pop up box. Edited by GAJohnnie, Dec 10 2018 - 18:33. I just went and subscribed.